The largest ski area on the continent, with 7,000 acres of skiable terrain, more than 200 marked trails, and 12 massive alpine bowls, including three glaciers. 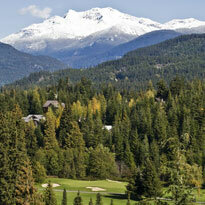 The two greatest vertical rise and ski mountains in North America, with Blackcomb rising one vertical mile (5280 feet) and Whistler rising 5,020 feet. The most slopeside lodging in North America. Average annual snowfall of 30 feet (9 metres), complemented by extensive snow making systems. A winter season that runs from November through May, with summer skiing continuing through August. 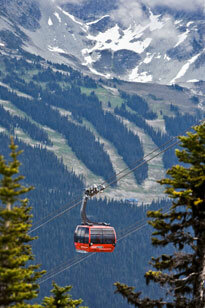 There is also the incredible Peak to Peak Gondola that takes you from Blackcomb to Whistler in 11 minutes flat. It is a skiing game-changer that whisks you from one world class Mountain to the other in phenomenal time; you can simply swing from one to the other as the weather changes, clouds break, or the powder bowls come free. You have to experience it to believe it! In the summer, the lifts stay open and instead of skiing you can hike. The mountains take on an entirely different complexion, and you can truly witness the tremendous geological forces that pushed these peaks up in the first place. There is also a very good chance of seeing a bear from the chairlifts. If you do happen to come across one on the trail, simply back away facing the bear, move slowly, and do not run. The bear is probably more threatened by you and generally wants nothing to do with the encounter except to move on and keep grazing. While up on Whistler or Blackcomb, make sure you to dine at Steeps Grill in the Roundhouse, or Christine’s in the Rendezvous. There are no shortage of dining options, and the views cannot be beat. For online equipment rental bookings and a 20% discount, contact Summit Sport. Weather updates and snow reports.